alaTest has collected and analyzed 163 reviews of Zoom Q3HD. The average rating for this product is 4.0/5, compared to an average rating of 4.0/5 for other Camcorders for all reviews. Reviews about the size and price are overall positive. The portability and zoom are also mentioned favorably. There are some less positive views about the viewfinder and reliability. There are some mixed views about the image quality. We analyzed user and expert ratings, product age and more factors. Compared to other Camcorders the Zoom Q3HD is awarded an overall alaScore™ of 87/100 = Very good quality. alaTest has collected and analyzed 2 user reviews of Zoom Q3HD from Amazon.co.uk. The average user rating for this product is 4.5/5, compared to an average user rating of 4.0/5 for other Camcorders on Amazon.co.uk. Reviewers really like the image quality and durability. Some have doubts about the reliability and design. alaTest has collected and analyzed 118 user reviews of Zoom Q3HD from Amazon.com. The average user rating for this product is 4.0/5, compared to an average user rating of 3.9/5 for other Camcorders on Amazon.com. Views about the size and price are overall positive. The portability and zoom are also appreciated, but opinions are divided on the durability. Many are negative about the viewfinder and reliability. The $299 Q3HD Hand Video Recorder's video quality doesn't measure up to its competitors, but it delivers superior stereo audio control and quality for those who need it. Excellent audio quality. Strong video quality. Multiple audio recording options. External microphone input. Headphone jack. Mini-HDMI out. Expensive. No autofocus. No macro mode. No still image capture. Only 2GB of internal storage. Only part of display is viewable while recording video. No rechargeable lithium ion batteries. 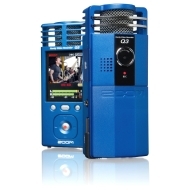 The Zoom Q3 is a portable video recorder with uncompromising audio quality. Its small size, removable SDHC storage, built-in USB cable, and replaceable batteries, make it ideal for on-the-go musicians and journalists. Video quality is mediocre-looking and uses a standard-definition resolution that feels mismatched with its high-definition audio capabilities. The Zoom Q3 is long on audio features, but short on video quality, but it fills a niche for musicians and avid concertgoers who may prize sound above all other considerations. This quirky looking pocket cam delivers outstanding audio quality. But does it have the HD video performance to match?